Bold, smooth, earthy flavor that is satisfying and can be consumed as an alternative to coffee. Naturally detoxifying and energizing pu-erh tea contains caffeine and l-theanine for increased energy and focus. Bloody Sherry has a rich, smooth malty taste, & energizing healthy properties. 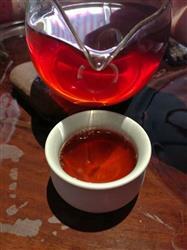 In China it is called the “skinny girls’ tea” because it is traditionally known to improve digestion & metabolism. Bloody Sherry supports weight loss goals this Chinese herbal tea can help energize and curb hunger. High coffeine content, help you replace coffee, support weight loss. 3 grams of loose leaf tea in 200ml of 98℃ water for 30 seconds. Re-steep 6-10 times. Not that I've tried many pu erhs, but of the ones I have, this is my favourite. Upfront notes of spice, with an underlying earthiness and maybe some autumn leaves. As the cup cools the mushrooms become prominent. Today I steeped this one at a lower temp for a longer time. I got more creamy nuttiness and less mushroom notes. Yummmmmmm! I still love this one. It��s just easy to drink, not fussy, not finicky _ let it steep for 3 minutes on your desk and it just gets deeper with out anything nasty happening. it was just what I wanted, just what I needed. I steeped a heaping tsp in an 8oz or so cup for 3 minutes. Smooth, rich, mellow, earthy, a little sweet. I sat with that cup, sipping & savoring while listening to my final student of the day, & it was just what I wanted, just what I needed.